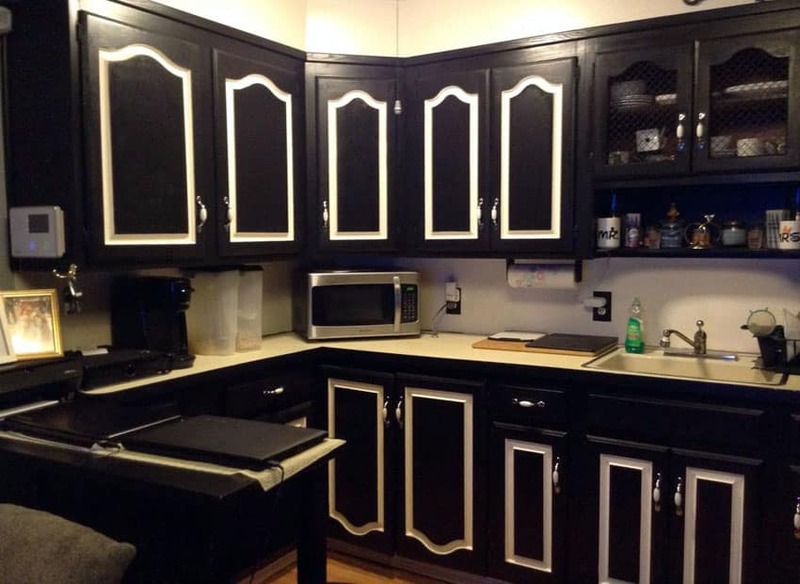 This picture gallery showcases black kitchen cabinets in a variety of designs. A black cabinet kitchen can look absolutely stunning when combined with the right types of materials and finishes. 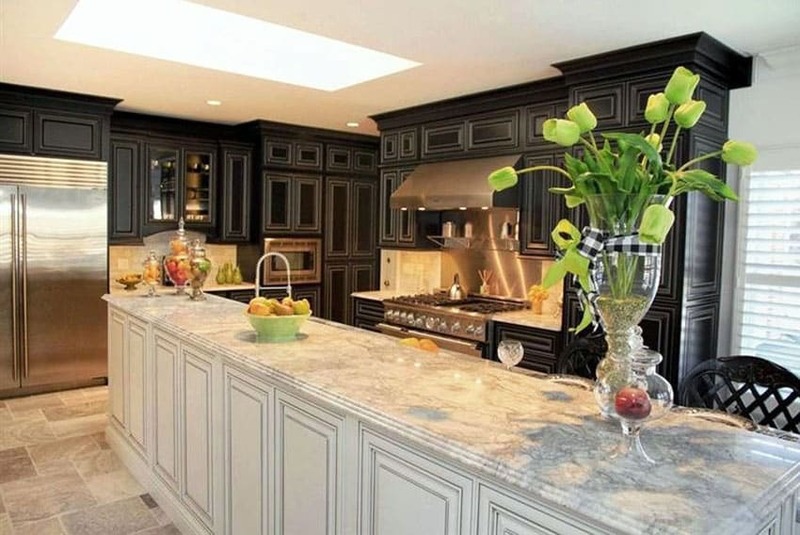 Get kitchen ideas for matching countertops, flooring, islands, tables and decor to black cabinetry. For any kitchen with color motifs, it is imperative to find furniture and accessories that match the look you’re going for. In the photo example above, the salt and pepper shakers, tabletop decors, and even the bar stool upholstery is in a matching black. This contemporary kitchen is also equipped with Giallo Verona granite counters that create a nice speckled contrast to the flat black of the cabinets. 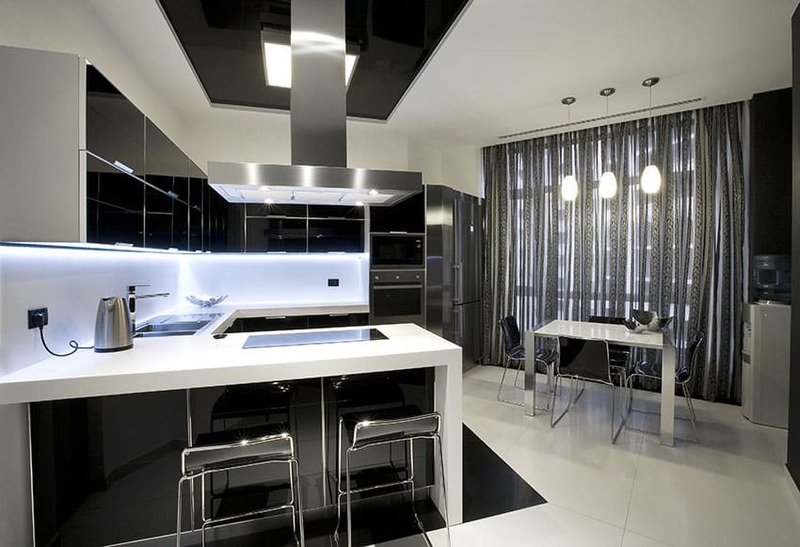 Black has been a timeless color choice for any interior design and the kitchen is not exempt from it. 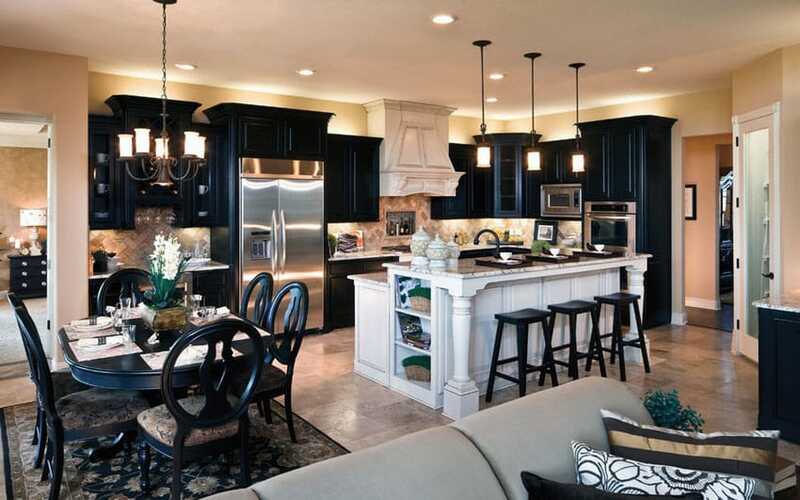 Black colored cabinets just exude an air of style and character very few other colors can match. It can pull off so many design styles that it’s no wonder it’s never really fallen out of style. Make no mistake, black is and always will be the new black. 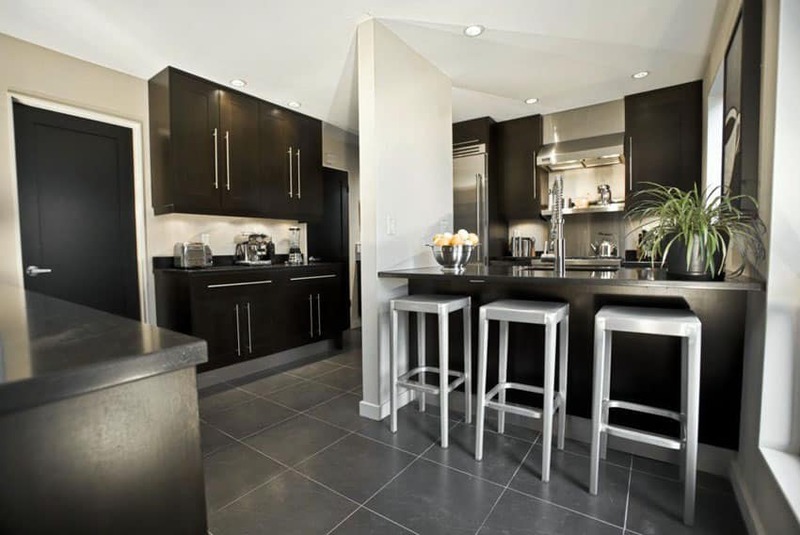 From traditional to modern kitchen designs using black cabinetry is a stylish choice that can have stunning results. 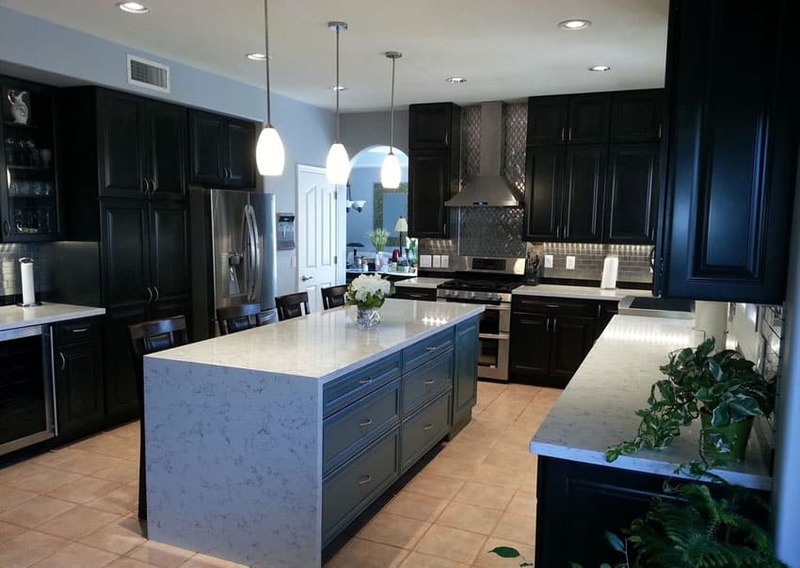 Using black cabinets allows one to choose from practically any color theme or materials to get the look you desire. 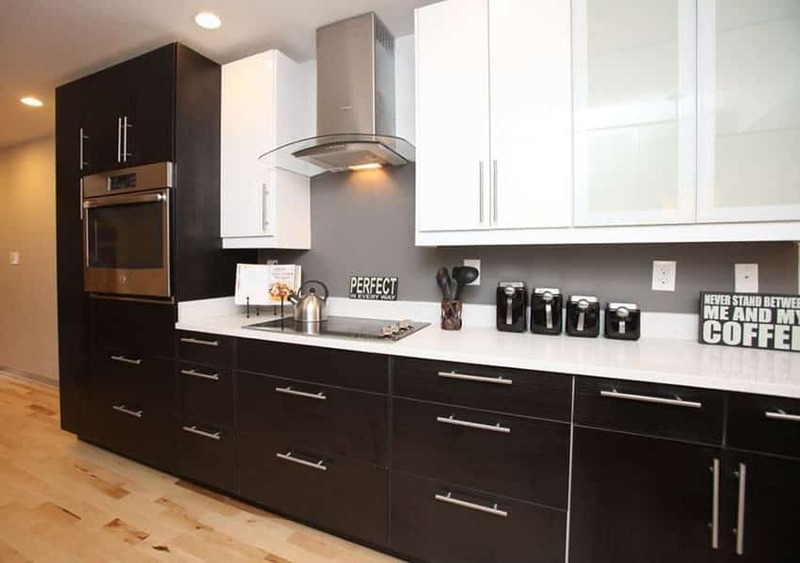 Here are a few factors to think about when designing with black kitchen cabinets in mind. Mixing the Old and the New – In this age of refurbished, up-cycled furniture, it can get difficult to find cabinets that match your vintage and antique kitchen pieces. Fortunately, black is a color that goes with design piece regardless of age. 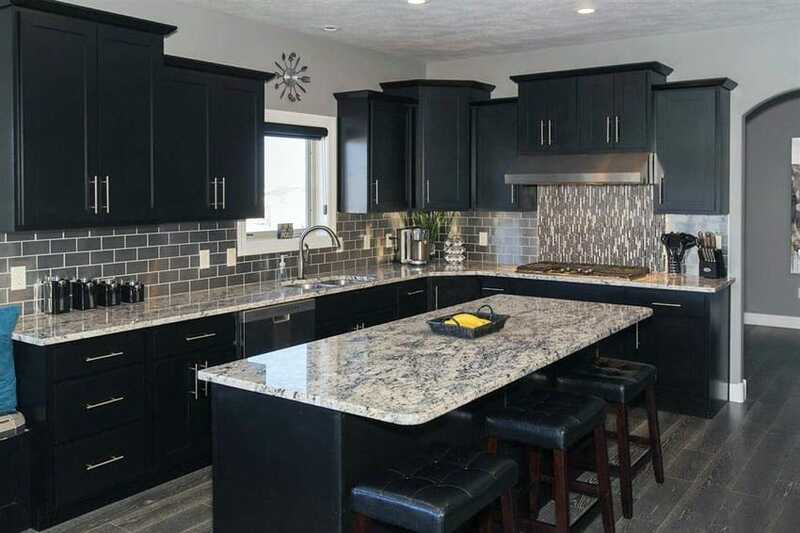 Cabinetry Styles – While black is often thought of as the perfect fit with contemporary or modern kitchen designs it can also be equally matched for a traditional style. the style you select will also have an effect of maintenance. Many modern cabinets feature a high-gloss black that is more prone to showing marks, fingerprints and smudges. To avoid this one may opt for a flat black finish that will be easier to maintain if that is a concern. Light and Dark – Contrast is an integral part of any interior design piece. 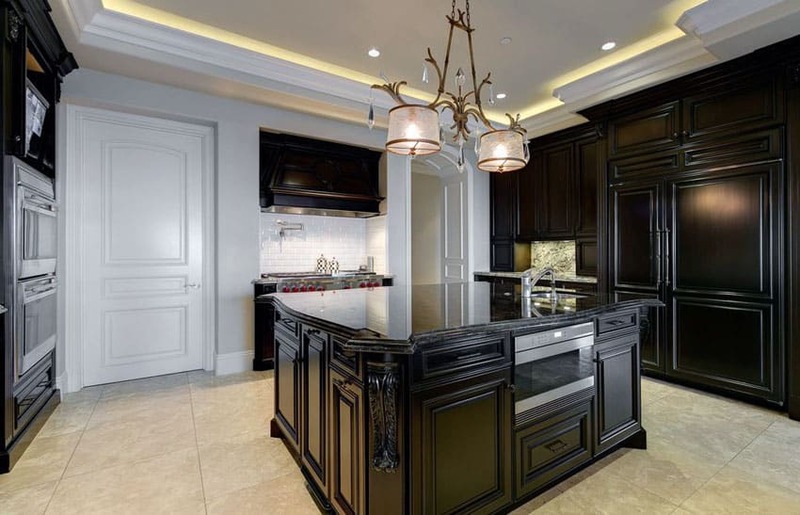 For kitchens with black cabinets, homeowners should consider using bright lights, artificial and natural, that serve to contrast the darkness of the materials of the cabinetry. Small, Dark, and Stylish – Small spaces appreciate the use of black color palettes just as much as large spaces do. 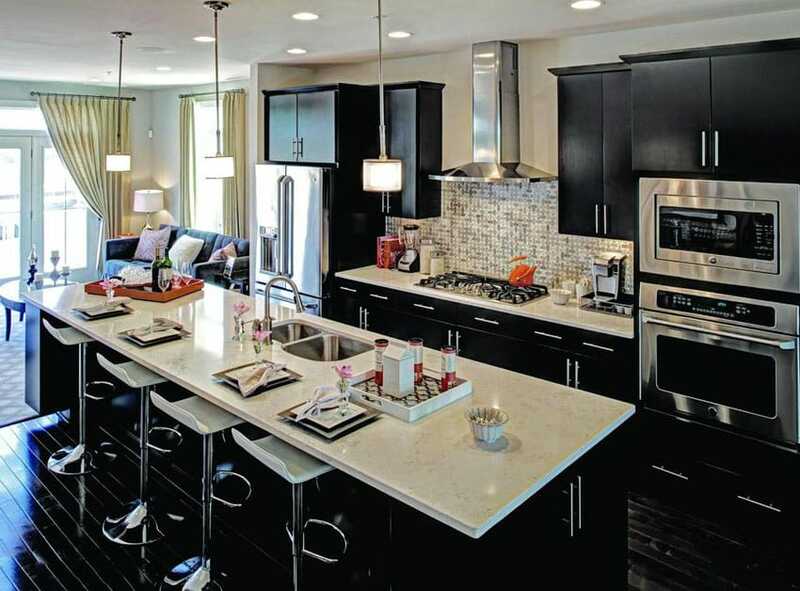 Black cabinets create an aura of class and style that really makes small kitchen spaces feel modern and bold. Traditionally Black – Black cabinets, although understandably modern in their style and usage, can also be used in traditional style kitchen. In fact, like the refurbished furniture mentioned before, black cabinets are wonderful partners to weathered and distressed materials as well. Gold and Gilded Class – For the more luxurious look, nothing beats the classic gold and black color combination. 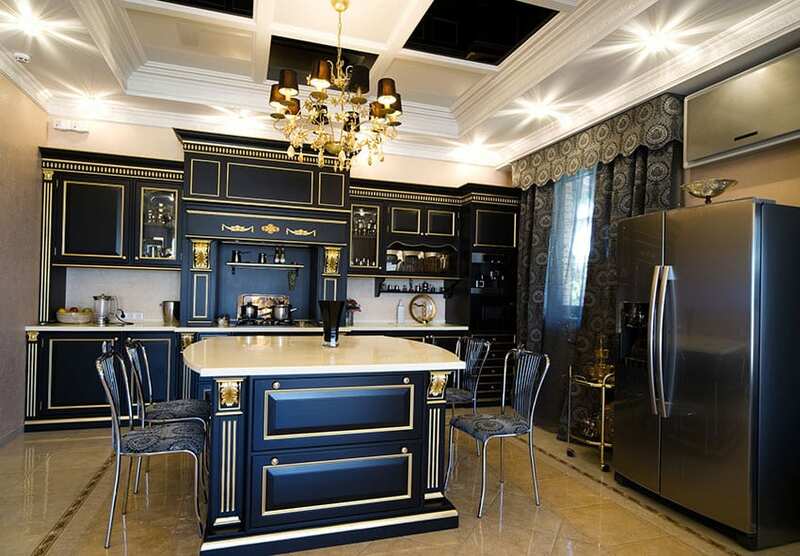 Even the most simple kitchen layouts and designs can be heavily enhance by the use of a dominant black color palette with accent lines or pieces in a shimmering gold. Red, White, and Black – One color combination that just doesn’t go out of style is the use of a popping red along with the monochromatic white and black color palette. Red is usually employed on design elements you with turn into accent pieces. Black and Materials – As for materials that pair well with black cabinets, you can never go wrong with marble and metallic chrome. Both create a good light contrast to the darkness of the cabinets and provide an eye-pleasing transition from the sleek black to the mellow brightness and reflective qualities of marble or metal. Kitchen Islands – When using kitchen islands on black cabinet kitchens, you can go one of two ways – keep the kitchen island black or make it a contrasting accent piece with a light and even white color. Metallic chrome surface are great partners to black cabinet kitchens such as this one. The luxury and contemporary aesthetic is also another reason to use sleek and reflective material surfaces such as chrome and stainless steel. The gray and white marble used on the island counter, main kitchen counter, and kitchen backsplash is a great partner to the black cabinets. 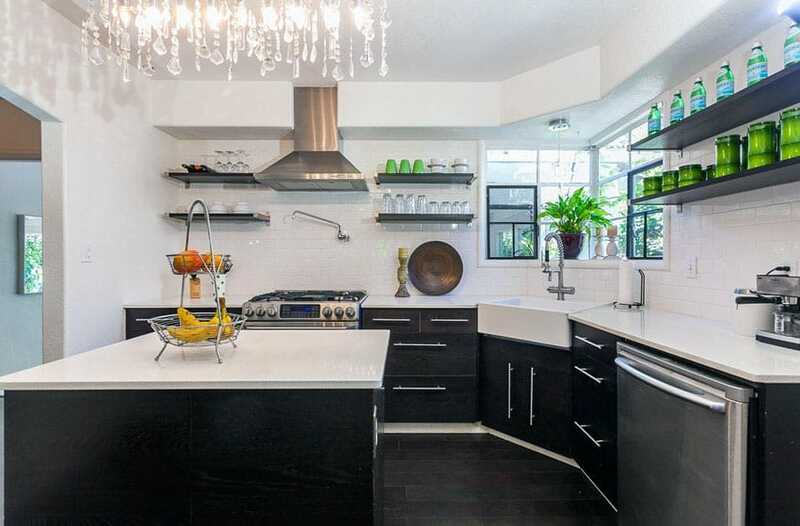 In some cases, black need not be the dominant color in a kitchen with a black cabinet setup. In this open concept kitchen and dining room space, the marbled pattern floor tiles, polished marble counter tops, and the gray painted walls and ceiling really define the space more than the black of the kitchen cabinets. In this type of design, the black functions as an accent or a design break that really makes it stand out in the space. Don’t be tricked into thinking that you have to stick to monochromatic color schemes when using black cabinets in your kitchen. Pops of color, when used intelligently, create dramatic results when used in spaces that are predominantly black and white. In this contemporary kitchen, the black cabinets and the white counter tops and walls have little drops of color here and there with the shelf top decor, the displayed glasses, and even the fruits in the kitchen. Black cabinets are perfect in period pieces such as this one. Vintage/retro style motifs use classic black and white with just subtle hints of color – in this example, splashes of red – to really drive its style and class home. This eclectic, industrial style kitchen also uses black cabinets with glass doors for extra effect and white marble counter tops to create good contrast. 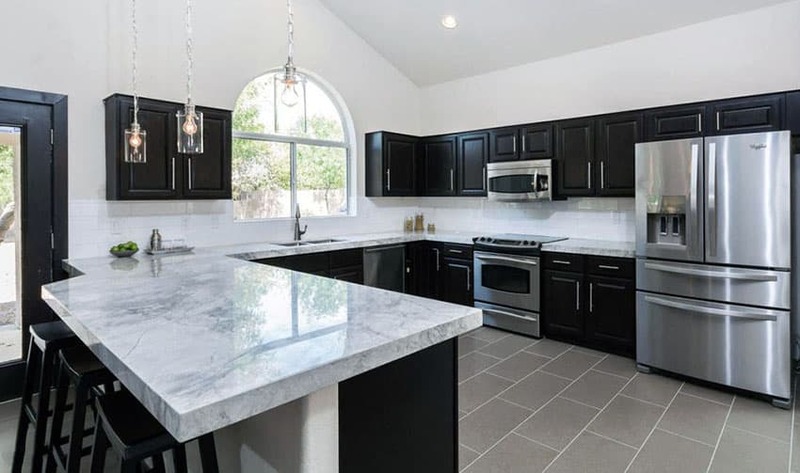 Most kitchen that use black cabinets are usually going for a more luxurious, classy look, but seeing as good design is design that goes against established conventions, it is also very possible to use black cabinets for more homey and cozy aesthetics. In this contemporary kitchen, white quartz was used as the material for the counters that create a good contrast with the black cabinetry, and personalized items used as decor all around the kitchen really make it feel like home. Limestone floor tiles such as the ones used in this example have a mellow beige tinge to them that go extremely well with solid black and white color motifs. In the cabinetry and walls of this kitchen, paneled cabinet doors give it a definitive classy look. This, along with the beautiful shaded chandelier and cove lighting used on the ceiling really make this room have a distinct design character. 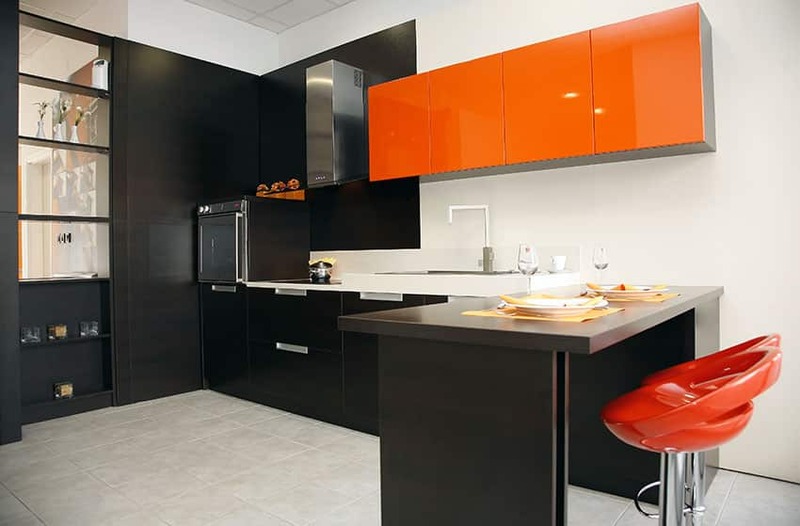 Flat black cabinet doors are great for minimalist and modern kitchen designs such as this one. Sleek stainless steel kitchen appliances – the refrigerator, range, and range hood – go extremely well with this approach to residential design. The breakfast bar island is also in a sleek black color, using a dark gray solid surface counter top material to match the cabinetry color of the kitchen. Another beautiful example of minimalist design that employs black cabinetry and monochromatic kitchen color palette, this kitchen makes amazing use of its small floor area and utilizes what it has to create a functional and stylish space. The black cabinetry matches the gray porcelain floor tiles used and the simple and bold black-white-gray color scheme makes the space feel roomy and airy. Simple monochromatic color palettes such as the one used in this black cabinet kitchen are also used to sometimes highlight single design elements in the room. 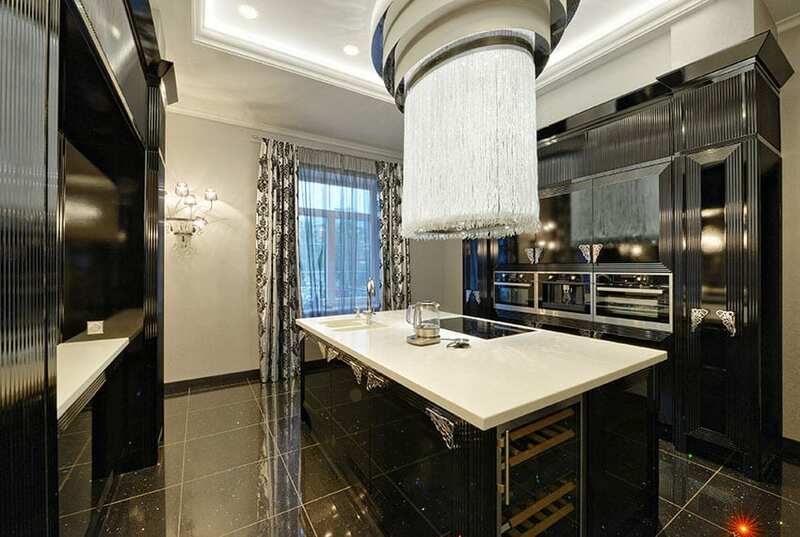 In this case, its the amazing stylized chandelier hanging above the black cabinet kitchen counter. 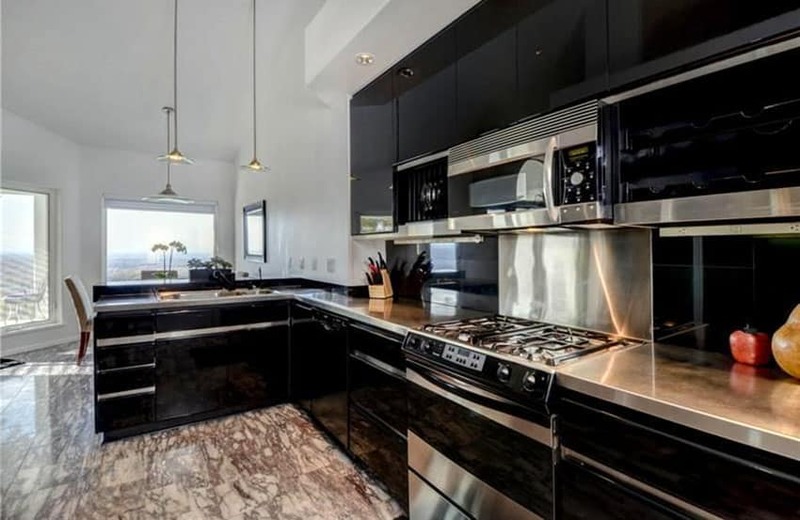 Other materials in the kitchen such as the white floor tiles, white marble counter and backsplash, and white ceilings are used in contrast to the black cabinetry. Metallic material surfaces don’t have to be limited to the kitchen appliances in a kitchen. 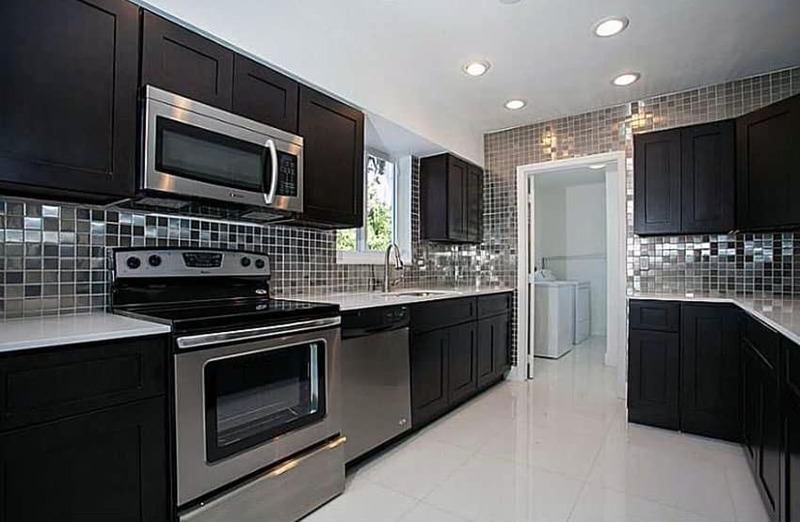 In this dark cabinet kitchen, not only does the design employ chrome stainless steel kitchen appliances and kitchen sink fixtures, but metallic mosaic tiles were also used as a backsplash and wall cover. This is a great example of when using less is sometimes more in interior and architectural design. In this kitchen, every kitchen cabinet and drawer is a flat white save for the jet black surface of the central island counter. The rest of the room is a subdued white with the floor being the only pop of brown with its polished wooden floor boards. This type of color combination really draws attention to the central kitchen island. Using black kitchen cabinets for the island is an effective way to bring the sophisticated style of black to your space without it being overwhelming or creating too dark of an environment. 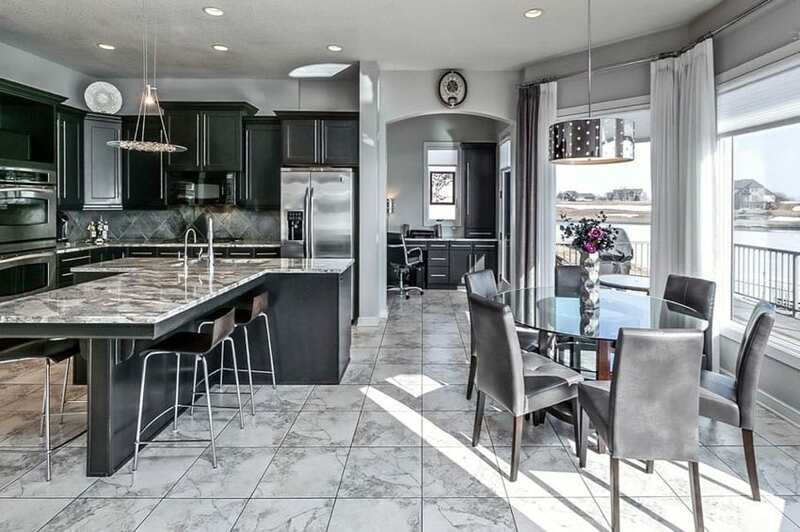 This open layout black kitchen cabinets have a jet black finish black bar stools, and even a black dining table set, offset only by the white kitchen island and breakfast bar in the middle of the kitchen. This kitchen also uses ample upward lighting on top of the black cabinets to sufficiently light up the space. A modern take on kitchen design, this contemporary space uses dark wood cabinets with white solid surface counters and a reflective stainless steel backsplash. The counter island also uses the counter surface material as a siding. The generous use of plant life in the room brightens up the space, and the beige floor tiles are a nice touch. One wall open layout kitchens such as this one often use kitchen peninsulas to create a spatial divide that separates the kitchen from the adjoining room. The use of jet black cabinets makes the separation even more distinct. The choice of using high gloss laminates for the cabinetry, with classy pendant lights, and marble floor tiles really creates an air of luxury for the room. High sloping ceilings like the one used in this open plan black cabinet kitchen really create a openness that few other kitchen configurations can pull off. 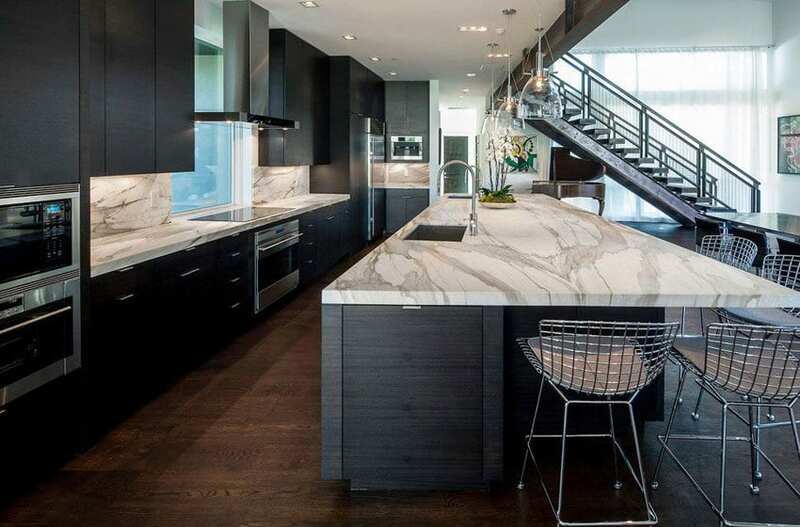 The marble counters also create a stylish vibe that enhances the space. White walls, gray ceramic floor tiles, and the quaint pendant lights also really make the space comfortable to be in. Even small kitchens can be greatly enhanced with the use of the right design elements. This traditional kitchen used black cabinets with white inlay doors in a layout that makes use of its otherwise limiting corner space. Clever use of corner cabinets really help with the utilization of this space. 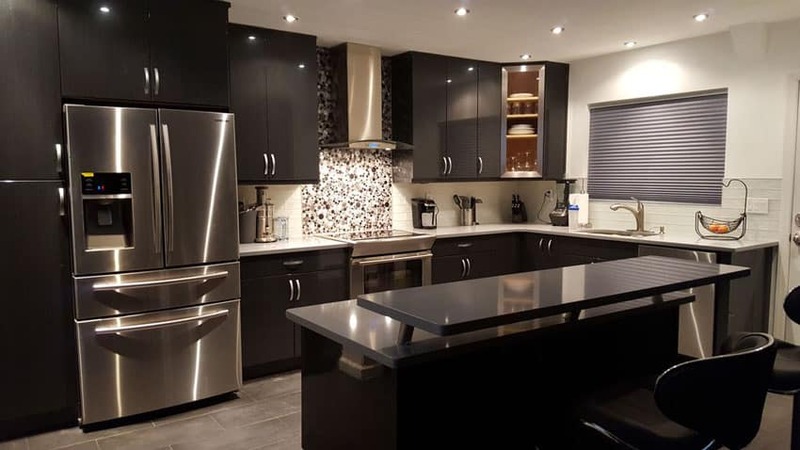 This black and white cabinet kitchen uses subdued, minimalist shapes and straight forward single loaded layout that creates an orderly and neat look a lot of homeowner would really like to go for. The ample number of storage areas in the forms of drawers and overhead cabinets also makes it so that the homeowner will never want for places to keep their kitchen tools and dishes. This eclectic luxury kitchen uses an array of different design elements to create a truly unique and rich kitchen space. The black cabinets are in texture in vertical grooves and adorned by subtle classy handles. The white counters are a nice touch and a good contrast to the black cabinets and speckled black floor tiles. The focal point of the space is the amazing light fixture at the middle of the room, with hundreds of hanging filaments that truly create a beautiful atmosphere to the room. Gold trim inlay and gilding are perfect partners for jet black cabinets. 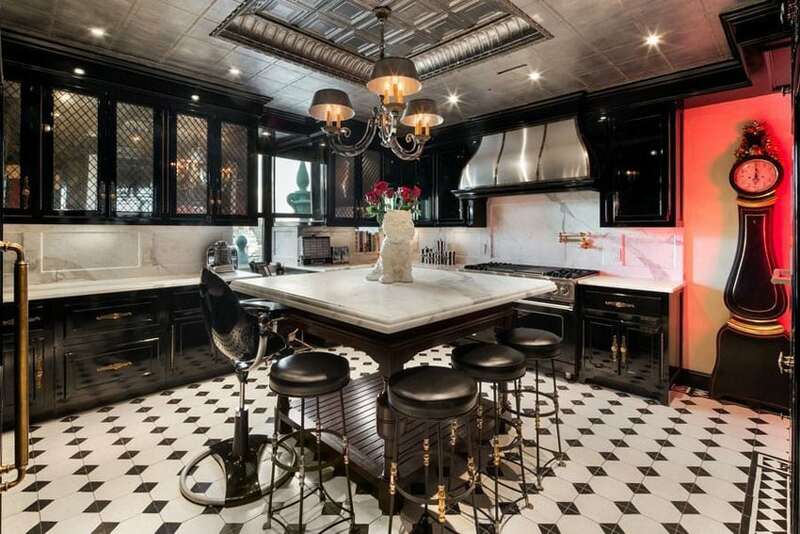 In this kitchen, in addition to the classy gold trims and carvings, the design also utilizes a tray ceiling with a black and white checkered pattern. In the middle of the ceiling ,we have a gold hanging chandelier to match the gold and black cabinetry. This modern black cabinet kitchen uses a wood grain island and breakfast bar connected to a stone island counter. It also has chrome lighting that really elevates the style of the space. The minimalist high gloss rectangular cabinet panels are reminiscent of a cubist artwork or painting and really sets the tone for the whole kitchen’s minimalist ambiance and feel. Using block colors such as the type of color combination used in this modern kitchen really makes for simple and bold kitchen styles. The blacks of the walls, cabinets, and counters are clumped together, with the rest of the kitchen in a flat white. The orange red cabinets, on the other hand, also match with the colorful flare of the red bar stools used for the kitchen peninsula. 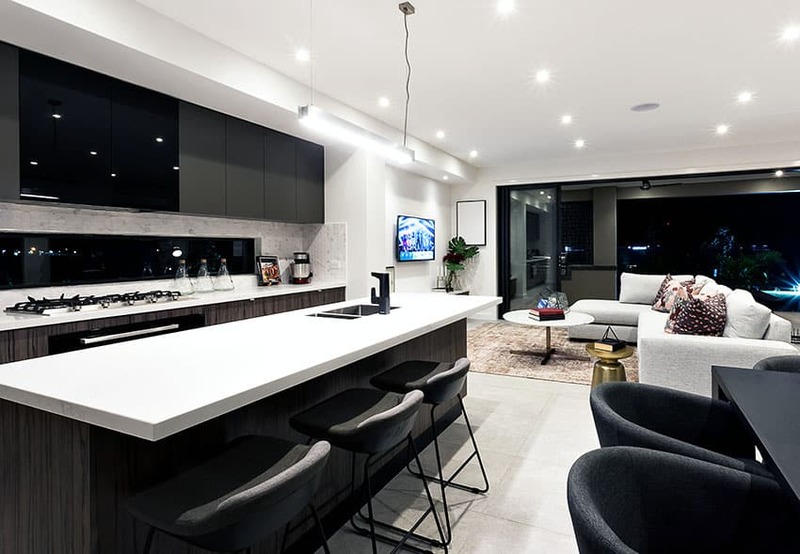 This modern kitchen uses black cabinets and white counters to really create a space that goes amazingly well with the adjoining living room in this open plan design. The single loaded kitchen layout is supplemented by the long kitchen island that also doubles as a breakfast bar. The black high gloss cabinet door panels are great partners for the matte white counter tops and the reflective metallic surfaces of the appliances, fixtures, and stools in this kitchen-dining room open layout design. The C-shaped layout makes maneuvering in this space very easy and the utilization of the kitchen convenient and intuitive. The peninsula also serves as a small dining breakfast bar. 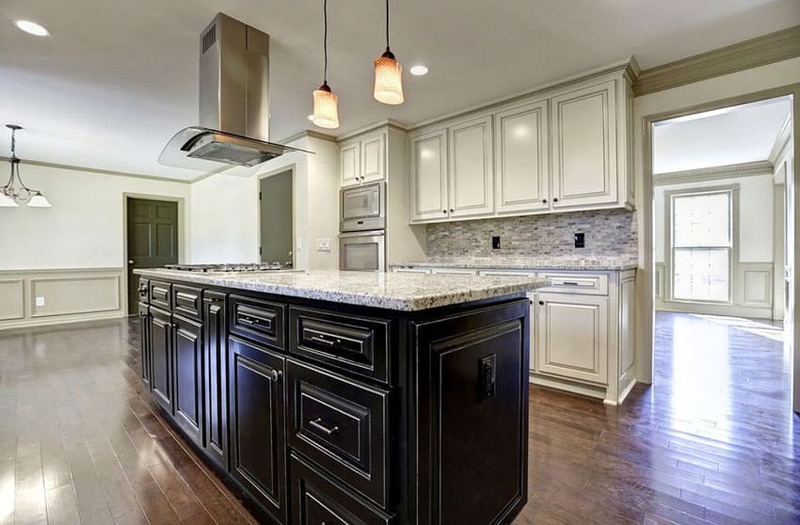 Visit this page for additional kitchens with dark cabinets for more ideas.